No-Bake Chocolate Peanut Butter Oatmeal Cups are the perfect grab and go snack or lunch box treat made with just a few simple ingredients! These oatmeal cups are delicious, chewy, creamy and crunchy at the same time. No-Bake Chocolate Peanut Butter Oatmeal Cups have two chewy and buttery oat layers, and melt-in-your-mouth chocolate-peanut butter fudge layer stuffed with crunchy salted peanuts! If you want more healthy snack, then check these No Bake Peanut Butter Granola Cups, too! These No-Bake Chocolate Peanut Butter Oatmeal Cups are the ultimate chocolate peanut butter treat! If you like chocolate Peanut Butter Oatmeal Bars you’ll love these delicious bites. These oatmeal cups are just a fun twist on classic oatmeal bars to make individual portion of your favorite treat. Oatmeal cups are easier to serve and grab and go on busy mornings, than regular bars. 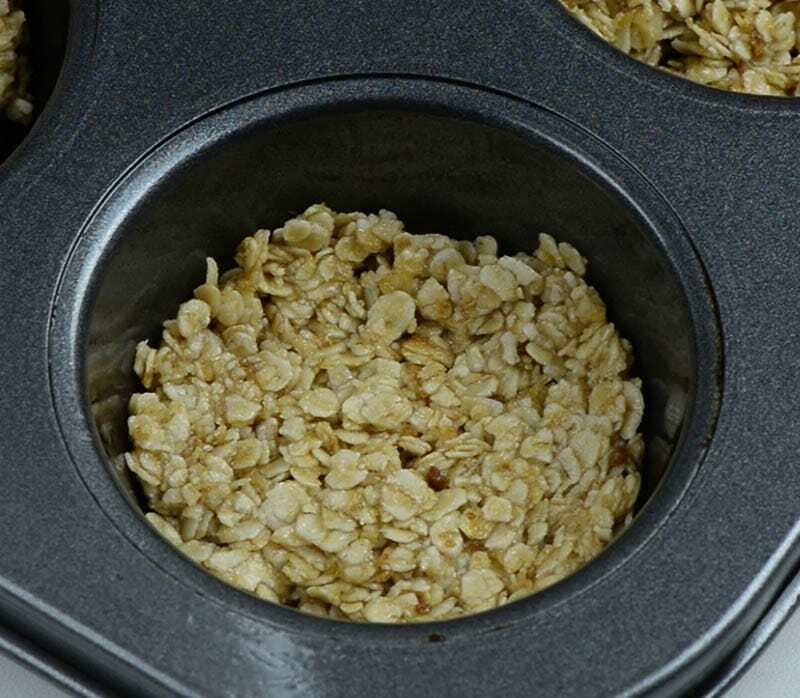 Just slip a one or two of these oatmeal cups in your lunch box and you’ll have delicious treat on hand to bust your energy in the middle of work day. The recipe is super simple and easy to make. For these oatmeal cups you’ll need instant (or quick cooking) oats, butter, brown sugar, peanut butter, chocolate and roasted peanuts. Simple ingredients for such a quick and easy recipe! What’s not to love about that?? Delicious oatmeal cups with three delicious layers. Chewy bottom and top layer and the center is smooth and creamy chocolate peanut butter fudge layer with crunchy salted peanuts. These No-Bake Chocolate Peanut Butter Oatmeal Cups are perfect grab and go snack. They are perfect addition for your lunch box to satisfy your sweet tooth. But they are also very satisfying as a dessert. And after all these yummy bites are much healthier than any other sweet. No-Bake Chocolate Peanut Butter Oatmeal Cups are the perfect grab and go snack or lunch box treat made with just a few simple ingredients! 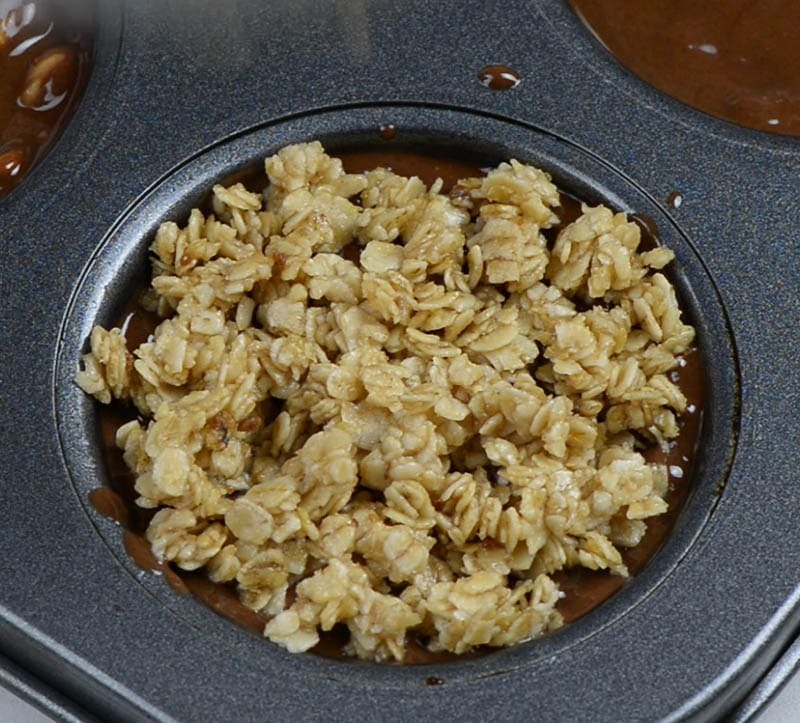 Grease cupcake pan with oil or non-stick spray, set aside. If you have silicone muffin pan you can use it to easily pop out the cups. In a microwave-safe bowl stir melted butter, sugar and vanilla until sugar dissolves. Then stir in instant oats. Microwave for 1 minute, then stir again. Press 2 Tablespoons of the mixture into the bottom of each cup. Melt chopped chocolate and peanut butter, stir well until smooth. Then stir in chopped peanuts. 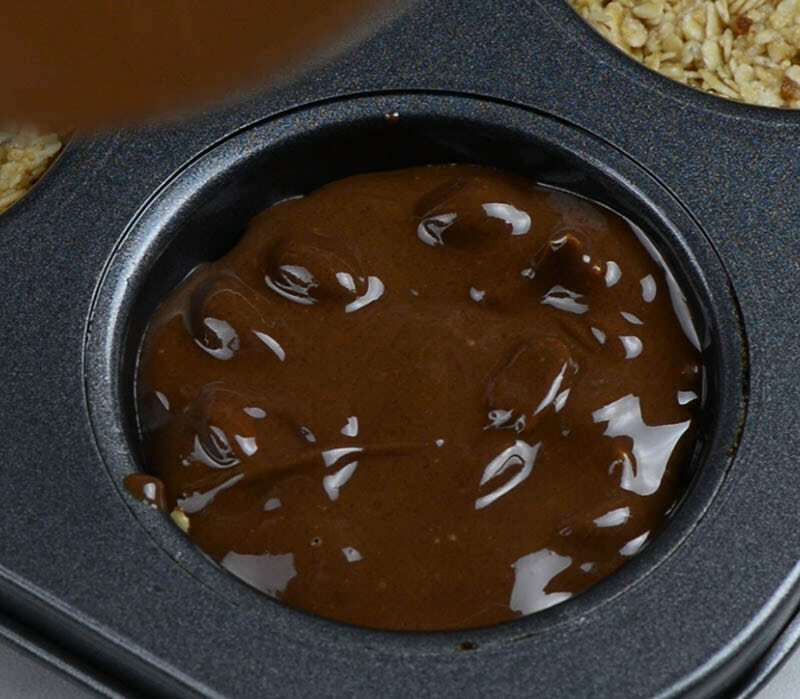 Spoon chocolate mixture over the bottom (oat) layer and spread evenly. Top with the remaining oats mixture and press down gently. Cover and refrigerate for 3-4 hours, or overnight. Run a thin knife around each oatmeal cup to remove it easier. If they are too stick to the pan, leave them 10 minutes at room temperature, then run a knife around each cup, remove and transfer into air-tight container. Stored in an airtight container at room temperature for a few days or in the fridge for up to 2 weeks. For longer storage, freeze up to 3 months and thaw overnight before serving.